We’ve been living with FPIES for almost two years, pretty much my son’s entire life. During that time I’ve gotten a little more comfortable with many things, such as leaving the house without showering, sticking my finger in a potentially full diaper, and conducting food trials. When it first became clear to me that we needed to be more systematic about giving E new food, I scoured the literature and the internet trying to find the best way to introduce a new food to a little boy with a great appetite and a growing number of allergies. I found pretty much nothing. The literature in the field is way to new to address such a specific aspect of FPIES with the detail that I was seeking. I quickly learned that every FPIES parent has their own process for food trials and that every FPIES kiddo is so different that individualized approaches are really best. One thing that I didn’t realize at the time was that even within the same child the approach to food trials changes over time. As you learn more about the types of triggers that your chid has and as you come to accept FPIES as something that you and your family is living with, not against, your approach might change. 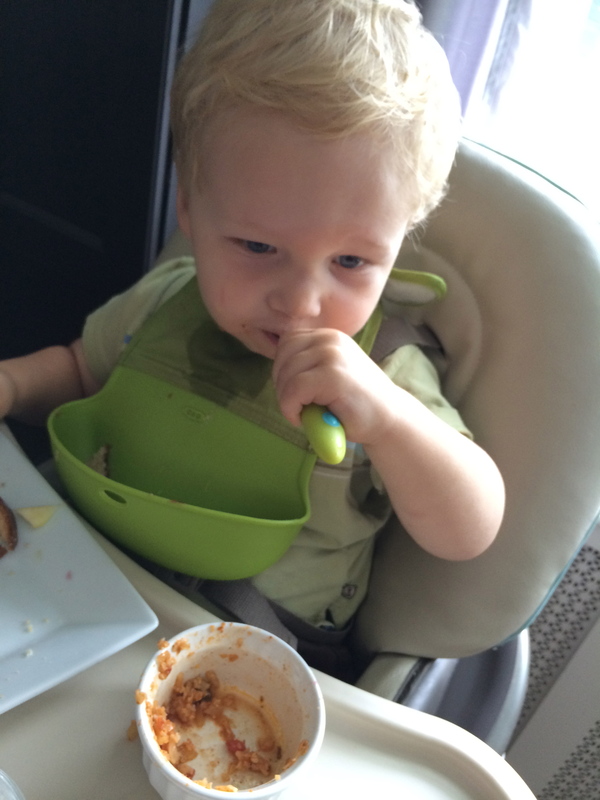 Our method of trying new foods has certainly evolved since we learned E had food allergies. I wanted to share some of this process and some of the variations that we use to demonstrate the truly experimental and ever-changing nature of the FPIES food trial. Also, to make a case for the fact that there is no right or wrong way to do it. First, I think it’s important to remember the purpose of the food trial. I think we get lost in the details and start to fetishize the trial so much that we forget why we do it and actually give it more power than it deserves. The purpose of the food trial is to see if a child is allergic to a particular food. The trial itself doesn’t determine whether or not there is an allergy. It’s just the “test” to find out. It’s the “scratch test of FPIES.” This might seem obvious but it’s so easily forgotten. I think all FPIES parents (myself included) fall into a trap of believing that our kids’ chances of passing are better if we do a trial “the right way.” That just isn’t the case. If your child is allergic to the food, he will react to it. Nothing you do makes him more or less allergic, to a point. (That being said, there is a school of thought that suggests you might have a better chance of passing if you wait longer to try certain foods or avoid a food for a while before trialling again. 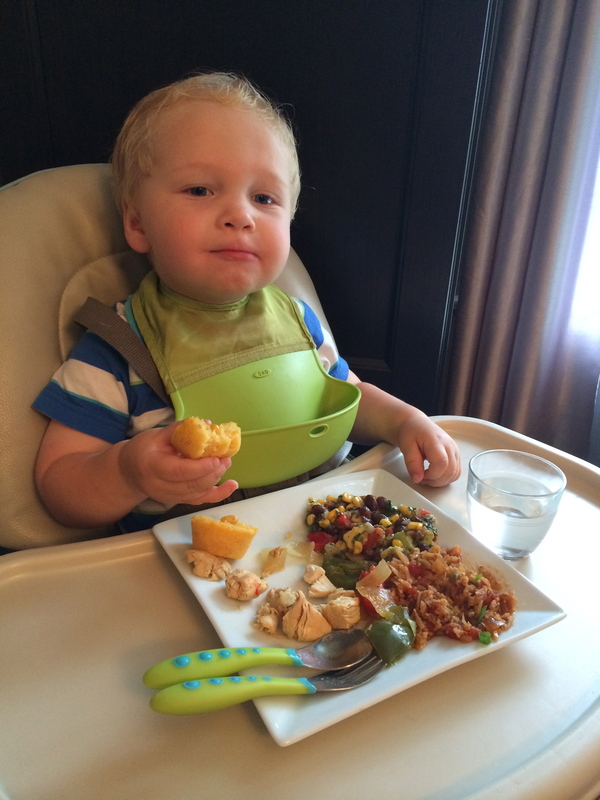 I’m really talking about the step after you decided that your child is ready to try a food). Actually, the point of a food trial is to cause a reaction. During a trial, you should do all that you can to be sure that if your child is allergic to a food you’ll know it. You want to see the reaction when you are ready for it and at a low dose, so that (theoretically) the reaction is as predictable and manageable as possible. You also want to have a reaction during the period of time when there is only one new food, so you know what caused the reaction. The thing that is most important about food trials is your child’s history – when they typically react (the amount of time after the food is given and the number of exposures that are typically needed before you see a reaction), how they react (what are the symptoms, how severe are they), and what types of foods your child reacts to. It’s also important to be realistic about your schedule and the resources you have available. Finally, you have to be honest with yourself about how important it is for you to be able to definitively say a food is safe (or not safe). It took us a long time to figure out the answers to all of these questions and, therefore, the best way to introduce E to new foods. We eventually developed the strict 15-day food trial protocol that I wrote about a couple of weeks ago. During this process we start with a low dose, increasing it slowly over about 5 days. We then give an appropriate serving size for another 4 days. After about 9 days of exposure to the food we take a 3 day break. Then we reintroduce the food for about 4 more days, the last two of which are at “overdose” amounts. During this strict trial protocol we are very careful to not introduce any other new foods. I truly believe this is the best way to get the cleanest data. If E is allergic to a food, I am sure he will react during this trial and we will know for sure which food is the culprit. But this protocol takes a long time. Over two weeks! That means that if we are always doing a trial with no breaks (for things like colds or recovery from a fail or holidays or mommy’s sanity), E could potentially gain 24 new foods a year. Sure, it seems like a lot but think about all of the food that you eat in a day, and all of the ingredients in a single (normal) recipe. Suddenly 24 isn’t so much, not to mention the fact that we are definitely going to take breaks (for my sanity if nothing else). So, we don’t always do this strict food trial protocol (*gasp*). It’s almost blasphemous in the FPIES world to admit that you don’t do strict food trials. But the one known when it comes to FPIES is that all kiddos with FPIES and all FPIES families are different. I couldn’t wake up every day with the mindset of entering into battle – it’s exhausting. I had to find a way to work FPIES into our lives and live with it, while still keeping E safe. So I started to make some changes. Oddly, our first “messy trials” followed E’s failed soy challenge. After such a dramatic fail, you’d think I’d hunker down and be more careful, not less. In a way I kind of was being more careful despite the “messiness” of my new version of food trials. The attending allergist at the challenge suggested that we trial a food for 12 days, not the 7 we had been doing up to that point. When I got home my mind was spinning – I was tired and stressed. And then I panicked that the foods that we thought were safe for E might not be because we didn’t trial them long enough. I couldn’t say for sure that every food on his safe list had been eaten at least 12 times. In the haze of stress and uncertainty I decided that we must retrial every food that E might not have had 12 times. At some point I had the realization that it would take weeks to get through all of the food and then we would be right we started. I didn’t want to go backwards so I developed a new protocol for these foods that were probably safe anyway. I referred to these as “messy food trials” because the thing that I eliminated was the one food at a time rule. That meant that if there was a reaction, the data it provided would be messy. If I was giving more than one food at time I wouldn’t be able to say for sure which food caused the reaction. I essentially staggered the start of each food but had multiple 12-day trials going at the same time. 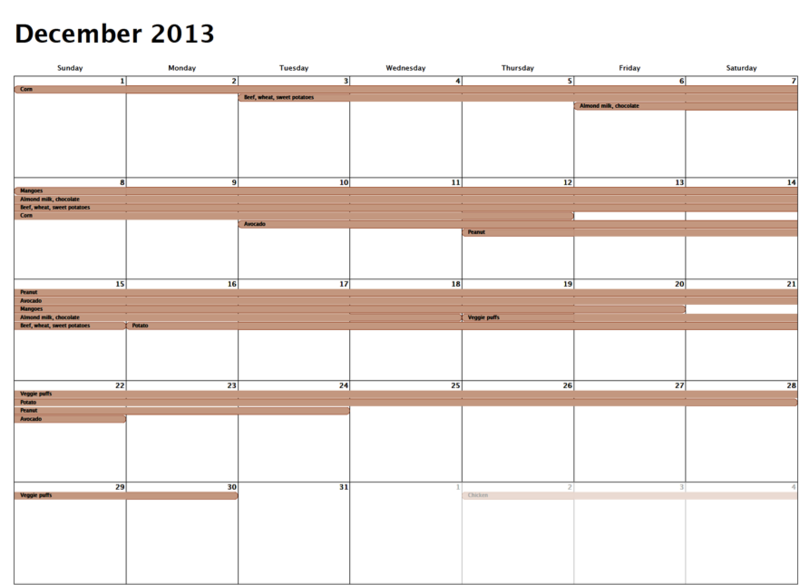 It was a lot to keep track of and I actually had to rely on my calendar to keep it all straight. At this point we hadn’t introduced the break into our trials so that made it easier. As you can see, last December was kind of a stressful month. Once we retrialed all of our previous safe foods we went back to perfecting our strict food trial protocol. We did that for a while, added more and more safes and went months without any reaction. Then our allergist gave us the ok to stop doing a full food trial for fruits and vegetables! E had passed all fruits and veggies without any problems (unless you count coconut as a fruit, which is up for debate) and she felt confident that he wasn’t going to react to any. I didn’t feel so confident. The food trial had become a little like my security blanket. After this crazy process I knew E was going to be ok whenever he had the food again. I needed that – I don’t do well with uncertainty at all. So, much to my husband’s dismay, I ignored her and continued to trial all foods, including fruits and vegetables. I did concede, however, that a “messy food trial” would be ok for those foods (again, because they were probably safe). I went back to all of the questions above that outline a food trial and I decided that the most important thing for us was to be able to say that E had eaten a food at least 12 times. I decided to simplify the system and started a low-tech hashmark system on post-it notes inside our kitchen cabinets. Every time we started a new food, I added it to list and kept track of exposures using hashmarks. I still continued with our protocol, but was sometimes willing to overlap trials of new fruits and vegetables. At some point we also added in the break, which I kept track of mentally. E did great – look at all those passes (and this is only some of them)! His allergist was right! He has passed all fruits and vegetables with no problem. E hasn’t had a reaction since his crab trail in April. That’s 7 months!! Is it possible that we’ve found all of his triggers? Maybe, developing new triggers after two years old is not very common (though not unheard of). At his last appointment with the allergist we were told that we don’t have to trial every new food anymore! That’s a pretty crazy thing to wrap your head around. And, again, the food trial protocol is my security blanket. Now I trial foods on a case by case basis, using the questions at the beginning of this post as a guide. I know that E typically reacts about 2-3 hours after he eats the trigger, usually after about 9 exposures and often after a break in the exposures. That means 2-3 hours after a new food I am on high alert, so I usually only do new foods at breakfast and lunchtime. Trying a new food at dinner interferes with bedtime and depending on how late dinner is, the reaction window may be after he’s down for the night (bedtime is pretty sacred at our house so I rarely do anything that can interfere). 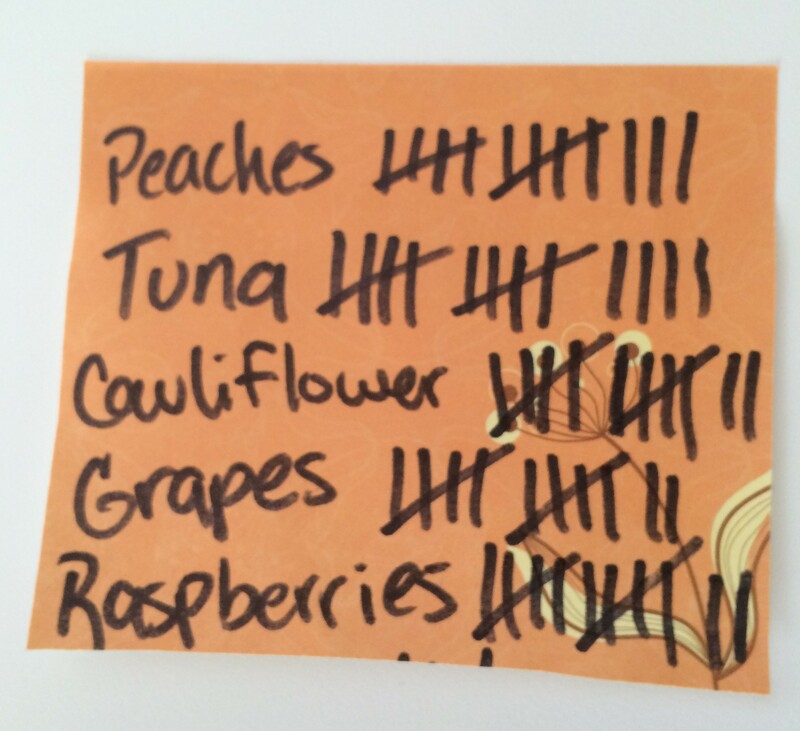 I continue to keep track of foods using my post-it note system. That way I can know how many exposures he’s had and how likely a reaction is. We are lucky because E’s reactions are typically not very severe. He has never had to be hospitalized following a reaction and I am the first to admit that he recovers faster than me. His crab reaction was even after an “overdose” amount and it wasn’t so bad. So, I typically don’t worry about starting at a super-low dose anymore. The thing that is the hardest to let go of is the belief that the importance of all foods is equal. For example, if I use thyme in one recipe, all other ingredients in the recipe are safe, and E does not have any other herb (or vegetable for that matter) triggers, it isn’t really that important to know for sure that thyme is safe. I might just go ahead and serve the recipe without doing an all out thyme trial. I’ve also started trialling entire recipes. For instance, if there are several new foods in one recipe, I’ll go ahead and give the entire recipe and track it as though it were one food. I also don’t worry about getting through a whole trial at once. I’ll give E the food when we have it until it runs out and then just give it to him again next time I make it, which might be several weeks (or longer) later. 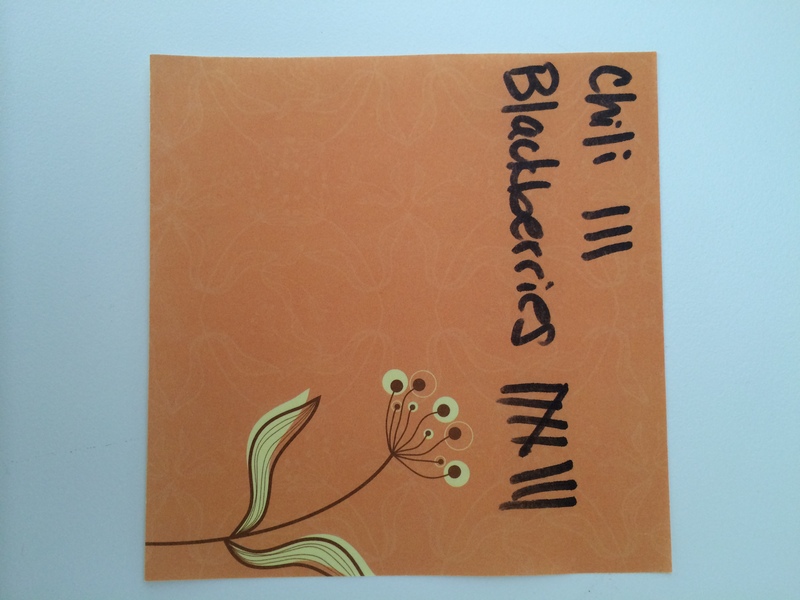 We eat chili a lot in the winter but it still might be spring before he has all 12 exposures. My chili recipe has several new but probably safe ingredients so I am “trialling” the whole recipe. Of course, I also allow myself to be ok with a “messy” reaction. This method will not give perfectly clean data. If there is a reaction I might not be able to tell you for sure what caused it. Then I’ll have to decide if I want just avoid all of the new foods that it can possibly be or if I want to go back and do more systematic trials. Luckily, we haven’t had to deal with that yet. Also, when we go back to retry our known triggers you better believe it will be the strictest version of our strict trial protocol! It was really strange at first but I love not being afraid of every new food! I now read ingredient lists looking only for our triggers (there are 7 so it’s still not an easy task). If there is a new food I just proceed with caution, but I proceed, something that I didn’t do a couple of months ago. Wow, this turned into a long post. I hope it’s helpful to see how food trials have changed for our family and I hope some of our process might give you some things to think about as you develop your own food trial protocols. Please know that this is a process that worked for us at this point in our FPIES journey. We can relax now that we have a handle on what E reacts to and how he reacts. He also has a ton of safe foods so there isn’t as much importance placed on each trial. Just remember to do what works for your family and embrace it – no matter how messy it is. If you are early in the FPIES process this probably sounds crazy to you! You’ll get to this point eventually, just hang in there and do what works for you one day at time. Following along and feeling your pain. My son’s food allergies started at age 5 and has progressed worse and worse until now. Doctors have been mostly stumped, but it seems that the official diagnosis is FPIES. Thinking of you and looking forward to sharing information to each other and to help others. Thanks Michelle! Welcome. I’m glad you are finally getting some answers! I love this! What you said is perfect: the point of a food trial is to force a reaction. I think most FPIES families prefer not to think of it that way, but it is the truth. I’m so happy you’ve found a system that works for you and proceeds much more quickly than the traditional systemic approach. I’m not sure I’m brave enough for that, as my sons reactions have mostly been chronic (sometimes as much as 3 weeks later), but it has given me food for thought. Mind if I link this post to my post about food trials? I think it gives a good example of what I summed up: every kiddo is different! Thank you! I think its most important to do what works for your kiddo and you. I think FPIES is sometimes harder on the parents and we need to do whatever it takes to preserve our sanity. It also helps that E usually has an acute reaction during a predictable time frame. I wish this stuff was more straightforward! I would love for you to link it to your post. I’m happy to provide another perspective!